It's time for a winter getaway! There are lots of things to keep you busy in the Carlisle area or you can just relax by the fire in on of our comfy rooms. On Saturday, Feb. 23, spend an evening with Olivia Newton-John at the H. Ric Luhrs Performing Arts Center on the campus of Shippensburg University. At the Village Artisans Gallery, you can watch Nancy Neslund paint some bright, bold works of art. Nancy will be the featured artist for the Artists in Action series at this special gift shop in Boiling Springs. Visit the shop on Saturday and enjoy a wonderful lunch at one of Dee's favorite restaurants! Enjoy a concert of Tchaikovsky's violin concerto, performed by Benjamin Shute (violin) and Kai-Ching Chang (piano) at the Weiss Center for the Arts at Dickinson College. If you want to travel a small distance from Pheasant Field, you might enjoy the Antique Auto Club of America's special Porche exhibit. More than 20 of these special sports cars are featured in this show, "Porche Style & Design", at the AACA Museum. While you're in the Hershey area, you must stop for some chocolate! All slopes are open and the conditions are great at Ski Roundtop! Remember that we have discount lift tickets here at Pheasant Field B&B. Take a snow break! We have been hosting some fun guests! This weekend we have a group of scrapbookers who are making wonderful works of art as they remember their summer vacations, special parties, and celebrations. There are horses in our barn who are moving from New Hampshire to Colorado along with their human and canine family members. We recently had a family stay with us. The dad was TDY at Carlisle Barracks while the 2 dogs, the mom, and the 3 boys made a home in boxwood cottage. The 5 year twin boys were very fond of Dee's breakfasts and created the cutest Thank You notes! Their next stop was to visit their "Grammy" in Indiana, PA. What fun "Grammy" is having this week with all that beautiful family visiting! 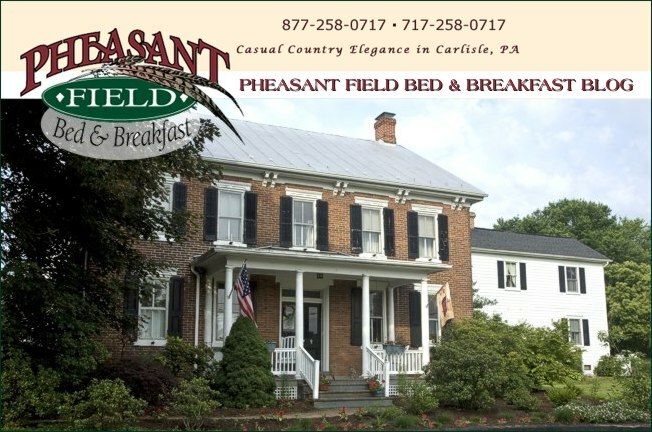 Come to Pheasant Field Bed & Breakfast for a great winter getaway!